We are a leading Manufacturer & Exporter of Industrial Spring. Our product range also comprises of Compression Springs, Torsion Springs and Conical Spring. 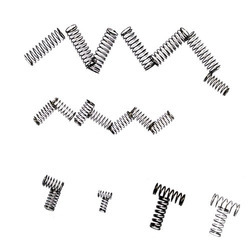 We are engaged in offering a superior quality range of Industrial Spring to the customers as per their specific requirements. These springs are designed as per the demand of different industries and sectors, with the assistance of our team of experts. Our quality controllers check these springs on certain standard parameters to gauge their flawless nature. We strongly believe in updating and changing our techniques of manufacturing a world class collection of Shaker Wire Form Industrial Spring in order to grow more in this industry. Keeping in mind the changing needs of our clients, we are providing these products in a variety of sizes and dimensions to choose from. In addition to this, we are delivering them to our clients within the given time.